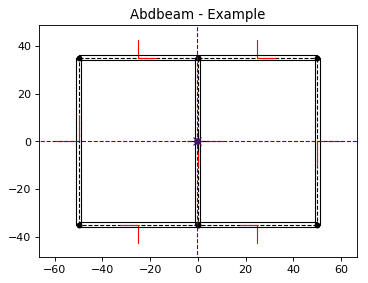 Abdbeam is a python package for the cross section analysis of thin-walled composite material beams of any shape. Plot cross sections, their properties and internal loads. The source code is hosted on GitHub at https://github.com/victorazzo/abdbeam. 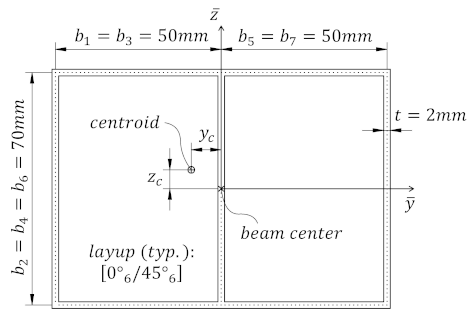 Booms are discrete stiffeners containing axial and torsional stiffnesses. Victorazzo DS, De Jesus A. A Kollár and Pluzsik anisotropic composite beam theory for arbitrary multicelled cross sections. Journal of Reinforced Plastics and Composites. 2016 Dec;35(23):1696-711.